Naoko Sakamoto (Tenmaya/ASICS) has announced her retirement this weekend after running the Kita Kyushu Women’s Invitational Ekiden. Brett Larner of Japan Running News has posted a good translation of an Asahi Shinbun article on Naoko’s announcement. It’s been my pleasure to work with Naoko from start to finish throughout her career as a pro athlete on Japan’s Tenmaya team. Without question, one of my all-time favorite athletes. Naoko worked hard as heck, as is the case with any Tenmaya runner, and was also one of the friendliest and most social of Japan’s world-class marathoners. There are all sorts of highlights to point to, any of which would have made for a career peak for most athletes. 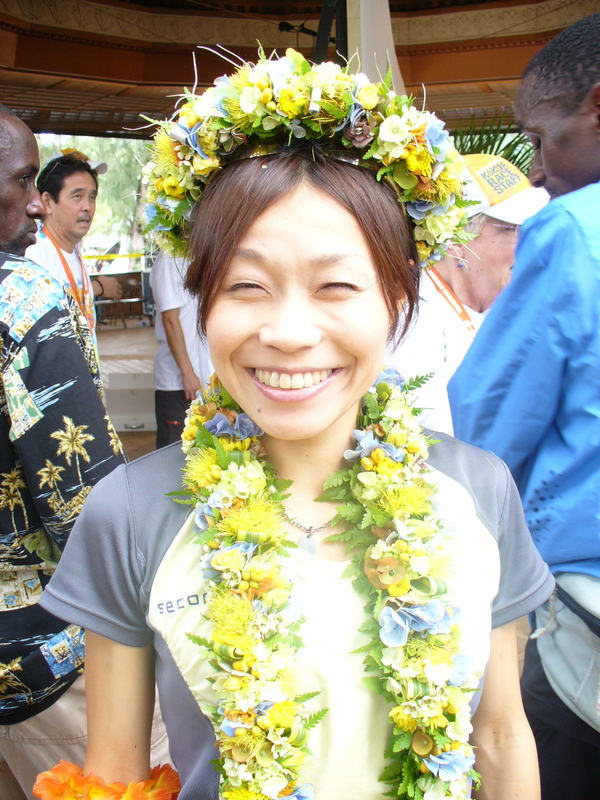 Naoko first jumped to prominence on the Japanese scene with her breakthrough 2:21:51 at Osaka in 2003, coming third behind Mizuki Noguchi and Masako Chiba on one of the great days of Japanese women’s marathoning. That trio came home in the same order seven months later with a spectacular 2nd-3rd-4th at the Paris World Championships, with only the legendary Catherine Ndereba standing between Japan and a sweep of the marathon medals. 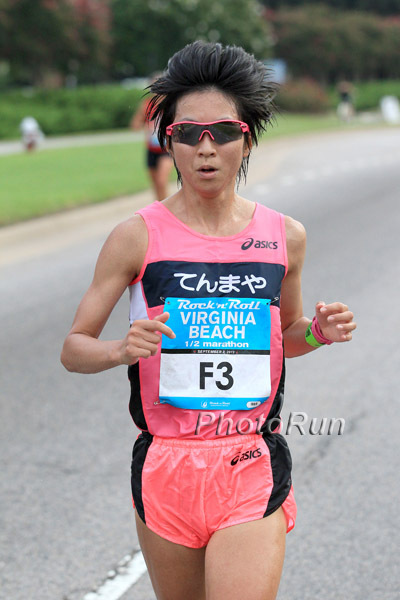 Naoko’s most tremendous run, though, was probably at the Osaka Women’s Marathon the next year. Even with the 4th-place world championship result, she was still without a place on the 2004 Olympic team. On a snowy, bone-chillingly cold day, the lead pack shivered through the half in something like 76 minutes. Naoko brought it home in a sub-70:00 second half (in the days when sub-70:00 marathon splits were still a rarity), including running 30K to 40K faster than her 10,000m PB, to win by over two minutes and lock in the Olympic berth. The next Spring, Coach Yutaka Taketomi hired me to go over to Athens with them to run on the course a few times and scout out housing for the Olympic Games. The road from Marathon into the city was a complete construction zone, and most of our long runs on the course were on dusty dirt roads that seemed in worse shape then when Pheidippides made the journey. Looking for a suitable Olympic rental, we hit almost every neighborhood of the first 10K of the course, including one place whose elderly owners gave us the full tale of the original Battle of Marathon with maps and all, and then had us sit down and toast the Greek Orthodox Easter with them. It was completely amazing to see everything had been completed when we arrived back in August for the Games. Our house was just near the 10K mark, with Mizuki Noguchi and her squad right across the road on the Aegean Sea side of the course. The Japanese women struck again in Athens, with all three in the top 7: Mizuko with the gold, Reiko Tosa 5th, and Naoko 7th. It says a lot about the former depth of Japanese women marathoning that at two of Naoko’s career highlights…4th in those Paris World Championships in 2003 and then 7th in the Athens Olympic Games…she was still only 3rd among the Japanese women. Naoko’s last race in the US thus turns out to have been last summer’s Rock ‘n’ Roll Virginia Beach Half-Marathon. Naoko came home 6th on VB’s usual hot, muggy summer day; but in the true spirit of all Rock ‘n’ Rollers, she made sure to go out and enjoy the rest of the day, getting in a stint of parasailing in the afternoon and then dancing up a storm at that evening’s Train concert on the beach. Naoko (2nd from the left) and her buddies at the 2012 Rock ‘n’ Roll Virginia Beach Expo. Freya Ross (adidas) chats with Race-Calendar.com in the UK about her favorite training sites, support from her husband Michael, and running with her brother and sisters. Click here for the full Q&A. Meghan Peyton (Team USA Minnesota/Mizuno) and Freya Ross (adidas) have been selected to represent their respective countries in next month’s Great Edinburgh Cross Country meet in Scotland. Meghan qualified for Team USA off her 4th-place result at the USATF National Club Cross Country Championships earlier this month, capping off a strong autumn in which she was also 5th at the Silicon Valley Turkey Trot 5K on Thanksgiving Day. She’ll have a boost in Scotland as Team USA Minnesota head coach Dennis Barker has been selected as a Team USA coach. It’s a Boy for Kiyoko Shimahara! Kiyoko after her (where else?) 2008 Honolulu victory. Long-time Boulder Wave athlete Kiyoko Shimahara gave birth shortly after noon today (December 6th Japan time) to her first baby, a boy coming in at 5 lb 18 oz and 19″ (2680 grams, 47.5 cm). Mom and son both reported doing well and in perfect health. No name yet for the baby. Kiyoko was for many years a member of the Shiseido Running Club before leaving to become one of the founding athletes on the independent Second Wind AC in Tokyo. She has enjoyed a stellar career with numerous top 3 finishes in marathons and road races around the world, including victories at the 2008 Honolulu Marathon, the 2009 Hokkaido Marathon, and the 2009 Yokohama Women’s Marathon; silver medal in the 2006 Asian Games marathon; 6th place in the 2007 IAAF Osaka World Championships Marathon; 3rd in the 2009 Chicago Marathon, and a PB of 2:25:11. In comments she released via her Second Wind club today, Kiyoko is leaving the door open to a possible return to training and racing, waiting to see how she feels in the upcoming months. Irvette van Zyl Won the Tough One! Late news, but…Irvette van Zyl (nee van Blerk) took the women’s title last Sunday (November 24th) at South Africa’s 39th City Lodge RAC Tough One 32K in 2:04:44, nearly a minute up on 2nd place Kim Laxton. 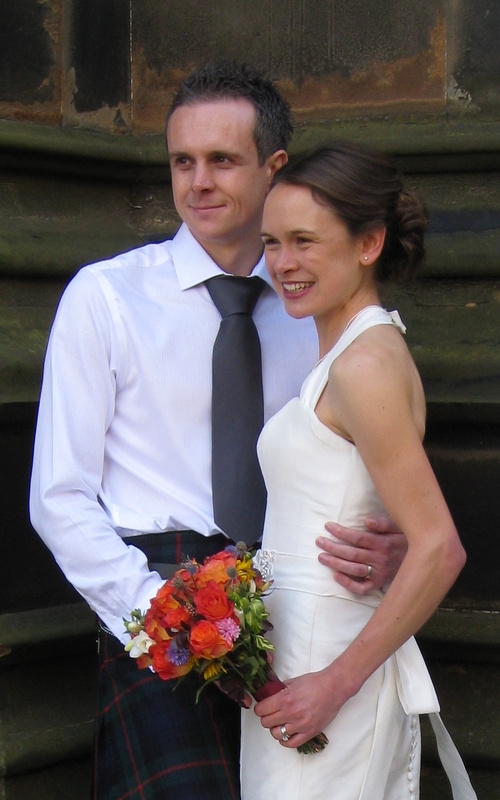 It was Irvette’s second title at the Tough One, following her 2:04:54 win in 2010. Nuta Olaru Wins A Close One in Windy Vegas! Nuta Olaru (ASICS) has just won this evening’s Zappos.com Las Vegas Rock ‘n’ Roll Marathon, her second win this year on Competitor Group’s Rock ‘n’ Roll circuit. Her 2:51:31 win was just two seconds ahead of runner-up Andrian Neal. The margin of victory was a repeat of her two-second victory in October’s USATF master’s championship. The Competitor Group website shows tonight’s finish as being even closer, 1.27 seconds. “This was so tough, it was very, very windy. I also had a cramp in my right leg, so I decided to wait and sprint the final 100m. It was a crazy wind…sometimes behind us, sometimes behind, left side, right side. I feel like the last ten miles it was only in our faces, ” commented Nuta after the race. If anything, Nuta’s sprinting must be getting better with age; at the 2005 New Las Vegas Marathon, she was part of a four-women lead pack still together with 400m to go, and ended up 4th in the final sprint. Louise Damen (adidas) has earned a spot for next month’s European Cross-Country Championships by finishing as 1st senior and 3rd overall in yesterday’s McCain UK Cross Challenge incorporating the European Cross-Country Trials. It was a great confidence-building run for Louise after a long stretch of physical rehab this year. Louise completed the 8.1 km course in Liverpool’s Sefton Park in 27:55, commenting afterwards on the UK Athletics website, “I’m no spring chicken, it’s ten years since I won my first senior GB vest, so I’m really pleased…The under-23 girls are so strong and it’s great to see them step up. When I found myself at the front it was unintentional and I decided to pull back a bit. I didn’t feel too good on the second lap and got a bit detached but on the final lap I knew I had to use my marathon strength and I felt good.” Louise was also on the 2010 silver medal-winning UK senior women’s team at the Europeans. The European Championships will be held in Budapest, Hungary, on Sunday, December 9th. Lidia Simon (ASICS) successfully defended her title today at the Osaka Marathon, winning in 2:33:12 (adjusted). This is Lidia’s fifth career marathon win in the city of Osaka, going along with her three career wins at the Osaka International Ladies’ Marathon and her 2:32:48 victory in last year’s inaugural running of the Osaka Marathon mass race. This past summer, Lidia became the first woman ever to have competed in five Olympic marathons. Madalina Florea (adidas) and Cristiana Frumuz (adidas) both placed 7th in their respective sections of today’s 2012 Chiba International Ekiden in Japan, helping Romania place 10th among the 15 invited international teams. In cold, rainy, and very unpleasant race conditions, 19 year-old Madalina ran 16:21 for the 5km second leg of the race, temporarily moving Team Romania into 9th place. Anchoring the race with the 7.195 km final 6th leg, Cristiana ran a very solid 24:32, passing runners from Australia and Norway to carry Romania from 12th to 10th at the finish line in 2:13:41 for the 42.195 km distance. It was the second-fastest result ever for Romania since the Chiba organizers switched the ekiden format to a mix of three men and three women per team, just two seconds slower than their 2011 result of 2:13:39, despite today’s rough weather. Madalina and Cristiana are both part of the adidas Romania Development Program managed by Boulder Wave. 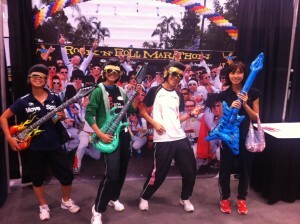 The Japan Running News blogspot carries a very thorough article on the race today. Monica Madalina Florea (adidas) and Cristiana Frumuz (adidas) of our adidas Romanian Development Program are set to run this morning’s (Friday, Japan time) Chiba International Ekiden in Japan. 19 year-old Florea, who broke through this summer with a 7th-place finish in the 5,000m at the IAAF World Junior Championships, will run the 5 km 2nd leg of the 42.195 km event; and Frumuz, who won the Romanian Half-Marathon Championship this autumn in a two-minute PB of 73:39, will take the 7.195 km anchor leg.